Normal tungsten carbide, because of the problems of "low hardness" or "high tendency to wear because of a little presence of a binder layer at WC to WC boundaries" has not so often been used as sandblasting nozzle material. Therefore, for sandblasting nozzles, cubic boron nitride(cBN) has been used so far, but this is a very expensive material, resulting in a cause of cost increases of products. In order to solve this issue, we developed high-hardness carbide (SH type) haviing almost no binder at the boundaries. 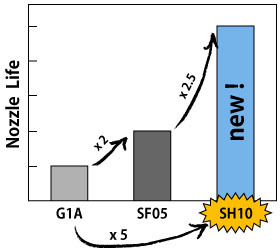 As a result of performing a test of sandblasting nozzles, ultrafine grain alloys (SF05) were twice longer in life than G1A, while SH10 was further 2.5 times longer in life than SF05. Whereas the life was 1/2 that of the case where cBN was used, the cost was 1/5, so that the running cost has become 1/2.5 that if cBN. As a result of performing a test wire-drawing dies and drawing dies as well, their lives were twice that of G1A. In addition to this, the carbide SH type is also applicable to nozzles for users other than sandblasting or to molds for use of powder molding.